Sign up to receive special insider notifications of deals, promotions, and new items! HEAD Shine 146cm Women's Snowboard with Matching NX One Bindings NEW. Brand new, Head Shine 146cm Snowboard with brand new Head NX Fay 1 Medium Bindings. Bindings fit women's boot sizes 7 - 10. The SHINE delivers all-mountain accessibility with the precision of combined flat and true camber and the enhanced torsional flex of a narrow waist. Add to this an easy-riding architecture and this directional twin shines from the terrain park to the freshies beyond the ropes. EASY BOARD ARCHITECTURE - A hyper-reactive, lightweight poplar core that is indestructible. TWIN DIRECTIONAL - Twin Directional boards are part precision all-mountain riding tool and part park and pipe machine. Extruded Base - Head Extruded bases are fast, durable and easy to maintain. Hybrid Camba DCT features a mix of regular and flat camber and a tapered, narrow waist for increased torsional flex. 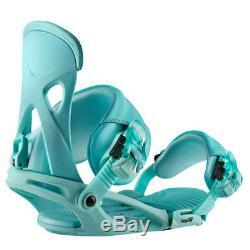 BINDINGS FIT WOMEN'S BOOT SIZES 7 - 10. The tool-free NX FAY 1 delivers easy riding in all terrains. From its tool-free adjustability and easy open and entry comfort straps to its forgiving flex pattern and cushioned and shock-absorbent base the NX ONE is all about building style and skills in comfort. Progression in snowboarding has never been so easy. The Adjustable Toe Ramp can be customized to fit any boot with a single screw and channel. 1 flexible / 10 stiff. The toe strap folds out from the baseplate, permitting easy entry without the hassle of kicking open or treading on the strap. EVA cushioning in the strategic zones of toe and heel absorbs shock and chatter. The day your order ships is not considered a transit day. This doesn't happen often but please don't panic if you only receive one package at a time. We will respond to all questions quickly! All sizes are listed in US sizes. We respond quickly to all questions! All items must be in the same condition as received, with all packaging, accessories and tags attached and included. When ordering snowboard boots, we recommend you order your normal size or a half size larger if you normally wear a half sized shoe. Also, be aware that snowboard boots are made to fit very snug, not like normal shoes. They must be very snug in order to maintain control of the board. Items can be exchanged after Christmas if there is a sizing issue. This is at our discretion and depends on the size/weight of the exchanged items. We are a small, family run business dedicated to finding you the best deals on sporting equipment, especially snowboard and ski equipment and apparel. We look for the best quality product at the best price and pass the savings on to you! We always answer all emails within 24 hours weekends included! But often in less than an hour. We welcome all questions so that you can find the perfect product for you! If someone else runs into you, unfortunately, this is also not covered. Freestyle Snowboarding - Using rails, boxes or other hard surfaces in the terrain park can cause damage to your board. Boots - Tears or rips caused by holding your board up while riding the lift, are not covered. If you do break a strap, let us know and we will see if we have any replacements we can send you. Also, lost screws or straps are not covered but if you do lose one, let us know and we will see if we have a replacement for you. We recommend you check all equipment every day before riding, and be careful when strapping in to avoid problems. We answer all emails quickly! Most emails are answered within an hour or two but all are answered within 24 hours 7 days a week. If you have not heard back from us for 24 hours, then we have not gotten the message, so please make sure that your message has gone through. To send us a message. Great deals on name brand ski and snowboard gear and apparel! The item "HEAD Shine 146cm Women's Snowboard with Matching NX One Bindings NEW" is in sale since Wednesday, August 8, 2018. This item is in the category "Sporting Goods\Winter Sports\Snowboarding\Snowboards". The seller is "snsboardz" and is located in Longmont, Colorado.